Spain's newly-elected Prime Minister's José Luis Rodriguez Zapatero visit to Morocco, April 24, brought new dynamism to Moroccan-Spanish Relations. It has become a tradition for new Spanish Prime Ministers to make Morocco their first foreign trip. Zapatero was received by HM King Mohammed VI in the Royal Palace in Casablanca. Then, in a park in the city centre of Casablanca, the two leaders unveiled a marble plaque dedicated to the memory of the 44 victims of the 2003 Casablanca suicide bombings series of suicide bombings in Casablanca in 2003. His one-day visit came as 14 Moroccans were being held in Spain suspected of involvement in the Madrid bombings. Prior to his brief visit, the new Spanish premier said his country needs to improve its relations with Morocco without any mediation "to guarantee stability and neighbourliness" in the western Mediterranean. Many political analysts had already predicted that Moroccan-Spanish relations would improve and be back to normal with the coming into power of the Spanish socialists. These relations have always been a subject of controversy, basically due to their sensitivity and complexity. Fishing rights for Spanish fishermen off Morocco's Atlantic coast have been a long-standing source of disagreement between the two countries, besides other issues including illegal immigration, Spain's enclaves of Ceuta and Melilla and other important issues. During the leadership of former Prime Minister José Maria Aznar, tensions between the two countries reached their peak. The Spanish government had provoked Morocco many times, especially when Jose Maria Aznar decorated his soldiers who had expelled a few Moroccans from the Leila Island, in the summer of 2002, with medals of a “utopic victory”. Just days before the quake that struck the northern region of Morocco on February 24, an “immature” remark by former Spanish Defense Minister Federico Trillo increased tensions between the two neighbors over the disputed Mediterranean islet. Trillo angered Morocco when he told supporters that he wished the 2002 military crisis with Rabat over the uninhabited Leila island had occurred earlier to allow Spain to exploit fishing rights in Moroccan waters. These tensions became more serious after the arrest of some Moroccans suspected of implication in the March 11 Madrid attacks. 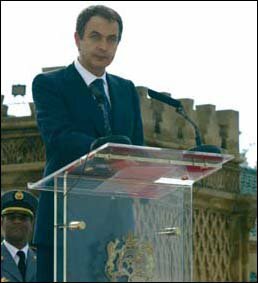 However, the new elected Prime Minister Luis Rodriguez Zapatero had pledged to improve these relations. Dr Lhassan Bouquentar, professor of international relations at the University of Rabat, said the new socialist government has already established good relations with the Moroccan political parties, especially the Socialist Union of Popular Forces (USFP). This indicated Spain's willingness to improve its relations with Morocco. According to him, Zapatero's government will communicate more with Morocco, a dialogue characterized by mutual respect and more coordination. He added that the two countries have to work closely to reach a just and logical solution to all the issues that affect them. Dr Bouquentar, however, stressed that Spain should adapt an objective position concerning the problem of the Sahara because it is well aware that solving this problem is necessary for the political stability of the whole region. Mr. Lamsari added that Morocco and Spain have to reach an agreement concerning all the hot issues that are a source of tension between the two countries, including security, clandestine migration, Sahara, fishing rights and so on. Dr Bouquentar, on the other hand thought that not only regional cooperation but also international assistance is needed to face the problem of clandestine emigration. He said that a possible regional cooperation will not only help Morocco and Spain to fight illegal emigration, but also to combat the rise of the expanding networks of smugglers who encourage desperate young people to emigrate illegally, as they propose a “ready-made” new life, “proper” papers and promises of employment which, in most cases, mean undeclared work or prostitution. He added that Morocco became highly conscious of this problem when the King created two new administration services to fight illegal emigration and crack down on human trafficking networks, namely the Directorate of Migration and Border Surveillance, and the Emigration Observatory. This initiative, first announced by H.M King Mohammed VI in November 2003, was widely welcomed in Spain. It seems that both Morocco and Spain want to overcome difficulties and look at the future with more optimism. Moroccans and Spaniards will have to increase cross cultural programmes and communicate more in order to improve their relations.